The Supreme Court case about whether a high school student’s rights were violated when he was punished for displaying a “Bong Hits 4 Jesus” banner on a public street may seem absurd, but merits close attention as it could have serious implications for free speech. It is clear that government schools do have the right to limit the speech of students, even political or religious speech, if that speech is disruptive to the school’s educational environment. For example, students cannot hold a rally against the war in Iraq during class time. This is not censorship of content as much as a time, place and manner restriction on free speech. A school would also be within its rights to prohibit students from wearing clothing with obscene language or pictures. The burden of proof as to whether speech is disruptive, however, must be on the school. In cases where the speech itself is not disruptive, government schools are much more limited in what they can do about it. If the school wins here, then there will be a chilling effect on free speech in schools throughout the country. Is this the way that we want to teach our young people to be involved in our constitutional republic? 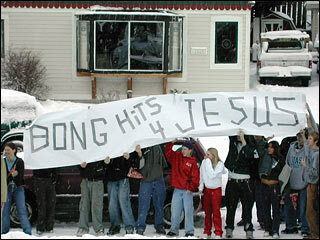 Yes, the “Bong Hits 4 Jesus” banner was intended to raise the ire of school administrators. There are certainly more mature and civil ways to engage in free speech, but that is not the issue here. As I said earlier this month, the first and most important line of defense for free speech is unpopular or “offensive” speech. If the government is allowed to punish unpopular or “offensive” speech, a precedent is set that allows for more and more restrictions on our First Amendment rights. The school went beyond its authority in punishing this student for his banner, which was on a public street and not on school property. Even though students were let out of school for the parade, I do not believe it is reasonable to describe it as a school event. When you strip away all of the excuses for censoring this young man, you get to the real issue. The principal was embarrassed by the banner and decided to punish a student with whom she has clashed in the past. That is highly inappropriate and cannot be allowed in a free society. I strongly agree with the decision to hold the principal personally accountable for her decision. If we are to be serious about protecting our liberty, then government officials who violate the Constitutional rights of American citizens must be held personally liable for their actions. Punishing these people would provide a much-needed deterrent to actions that would illegally restrict free speech and would be the best way to honor all of the American soldiers who have died defending our God-given liberties. For more on this case, see articles from AOL News, CNN.com, BBC News, and CBS News.